It’s not uncommon to feel like you’re the unluckiest person in the world, but what if you actually were? That’s the premise behind the absolutely hilarious new Disney series Milo Murphy’s Law, which is created by Phineas and Ferb creators Dan Povenmire and Jeff ‘Swampy’ Marsh. 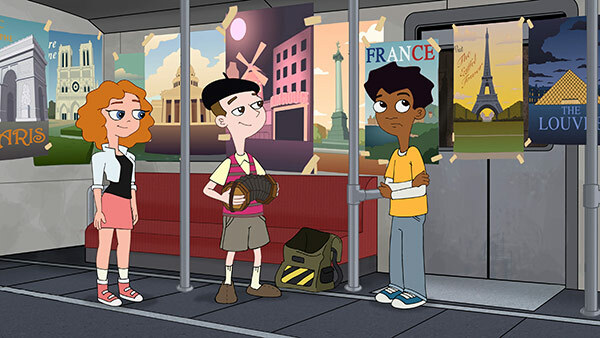 The series follows a young boy called Milo Murphy, who is fittingly a descendant of Murphy’s Law namesake Edward Murphy, as he approaches having the worst luck in the world with endearing optimism. We chatted to Dan and Swampy about what inspired Milo Murphy’s Law, choosing parody legend Weird Al Yankovic to voice him, and throwbacks to cult favourite Phineas and Ferb. “We wanted a show that would be funnier than absolutely hilarious,” says Dan, “We were working together on Phineas and Ferb and finishing that show and looking at what we should do after that. I was drawing some stuff for another pitch, and I had this secondary character that I had drawn that was sort of a caricature of a friend of ours. He’s super positive. I had this voice in my head of this super positive kid. It turned out to be a golden idea – but how did they find the perfect voice actor to portray the world’s most positive kid? Dan and Swampy have worked on some of the biggest names in animation, including The Simpsons and Family Guy – but they’re best known for creating Phineas and Ferb, a comedy series about two stepbrothers who get up to trouble during their summer vacation. The show ran from 2007 to 2015 on Disney Channel, collecting records, praise and fans throughout its run. Dan and Swampy are hoping those same fans will stick around for Milo Murphy’s Law, with Swampy saying: “If you like Phineas and Ferb, you’ll like this because it’s still our sense of humour. Milo Murphy’s Law will air on Disney Channel at 5pm every Monday and on DisneyLife from 3 April.